This lentiviral vector can be used to assay Cas9 activity. This lentiviral vector can be used to assay Cas9 activity. In the absence of Cas9, the cells are both resistant to puromycin and express EGFP. In the presence of functional levels of Cas9, the sgRNA expressed from the U6 cassette targets EGFP, and thus cells will still be puromycin-resistant, but will no longer express EGFP. The fraction of EGFP-positive and -negative cells can be accurately quantitated by flow cytometry. Please note that it is unlikely that 100% of cells will ever be EGFP-negative, as a fraction of cells are likely to have in-frame indels, and those the cells may still be green. This assay is best done with cells infected with pXPR_011 at an MOI <1. 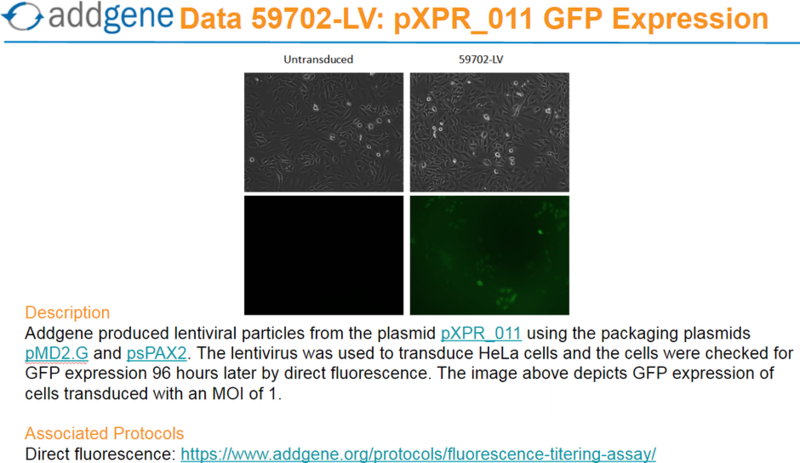 Ready-to-use Lentiviral Prep particles produced from pXPR_011 (#59702). In addition to the viral particles, you will also receive purified pXPR_011 plasmid DNA. Lentiviral particles carrying a GFP and puromycin resistance. This virus can be used as a control for assessing Cas9 activity. Colony formation assay: A549 cells were transduced with serial dilutions of 59702-LV and treated with puromycin. Puromycin-resistant colonies were expanded for approximately 2 weeks, stained with crystal violet, and counted. PCR confirmation of insert: PCR confirmation of insert: PCR was carried out with primers targeting the GFP and WPRE. The PCR product was visualized on an agarose gel for size confirmation. Confirmation of protein expression: HeLa cells were transduced with 59702-LV. 96 hours later, GFP expression was visualized with direct fluorescence. 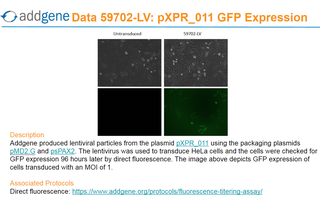 You can view the GFP expression here or in the image section at the top of this page.